Mayor Kenney discussed plans for a pre-apprenticeship program being launched as part of the Rebuild initiative. The historically narrow pipeline for minorities into Philadelphia's building trades just got a little wider. Under an agreement made public for the first time Tuesday, the trade unions and the city will launch a pre-apprenticeship program for the forthcoming Rebuild initiative, which is expected to involve renovations at upward of 150 parks, recreation centers, and libraries over the next six or more years. City officials said about 30 people, drawn from low-income neighborhoods, will be enrolled in the first year, with plans to increase that number over the project's lifespan. 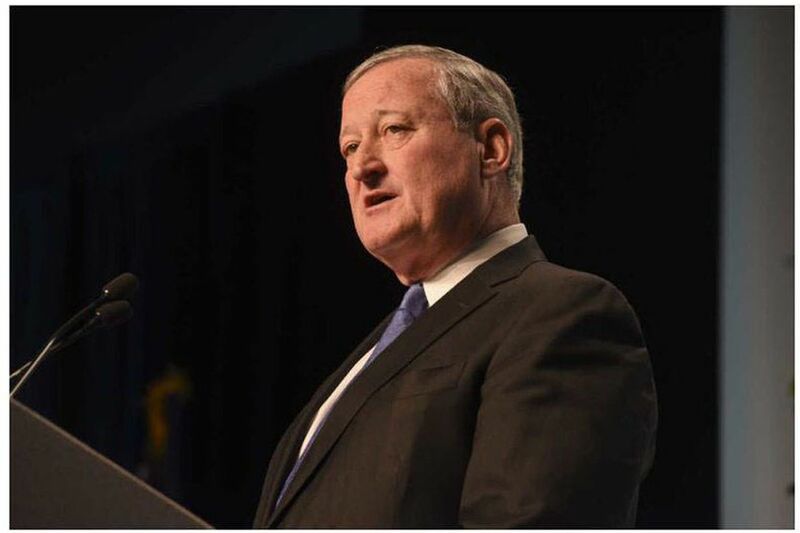 "We think we can help the father or mother that is just looking for a way to provide for his or her family," Mayor Kenney said at a Tuesday news conference. "We can help the young high school graduate who may not want to go to college but is ready to work and earn an honest living. And we can help our returning citizens who are trying to get their lives back on track." Rebuild, a $500 million project to be paid for with proceeds from the city's sweetened beverage tax, has been pitched by Kenney as a way to fight poverty, create equity among neighborhoods, and diversify the trades. Work could start later this year. The city has committed to having 45 percent of workers on Rebuild sites be minorities, and 50 percent be Philadelphia residents. Rebuild alone won't dramatically change the makeup of the city's unions. Current diversity data for the building trades isn't publicly available, but numbers provided in 2008 as part of the expansion of the Convention Center showed that a majority of the unions had less than 10 percent black membership at the time. But officials say Rebuild can have an outsize impact if the private sector adopts similar diversity goals and pre-apprenticeship requirements. Officials on Tuesday pointed to two other pre-apprenticeship programs as examples, one created as part of the construction of the new Pavilion at Penn Medicine and another for the construction of Brandywine Realty Trust's Schuylkill Yards. "The expectation, the bar, has been raised for any project taking place in neighborhoods across the city of Philadelphia," Councilwoman Cherelle L. Parker said at Tuesday's event. Under the agreement reached for Rebuild, any individual projects valued at $3 million would be subject to the agreement with the building trades. City officials have said they can't estimate how many sites that will be, since individual projects have yet to be selected. The pre-apprenticeship program is intended to open entry to that work — and to the building trades' own apprenticeship programs — to those who have traditionally faced barriers to getting into the unions. The varied trades include carpentry, plumbing, and brick laying. Those accepted to the pre-apprenticeship program will take part in a two-week boot camp where they will receive math and work-skills training and, if needed, help getting a driver's license. They then will be put to work on Rebuild sites while continuing training. They can take an apprenticeship test at any time during the 12-month pre-apprenticeship program, and will be allowed to take it a second time if needed. A second part of the agreement with the unions is focused on providing union membership for those who are already working in the construction and building industry. Those employees will have the opportunity to work on some Rebuild sites managed by the Philadelphia Redevelopment Authority and will then automatically gain membership to the unions. Though officials from the trades and the city on Tuesday touted the agreement as groundbreaking, skepticism remains. As Council vetted the proposal, some members said the agreement would have little impact if it didn't require that the unions accept a specific number of applicants. That is not part of the final document. Council pressure did lead the trades to commit to providing the demographic breakdown of workers on Rebuild sites. Previously, the agreement required the unions to provide only the workers' zip codes. "The Philadelphia Building Trades is a good partner," he said. "What we want is something that's consistent on every project. And going forward, sometimes it's difficult to change a culture that's been around for 50 years, but we're willing to do these things."